The one challenge that did come in the character building was that of Pablo, the mechanic. (Interestingly enough, Pablo is played by Freddie Rodriguez in the full FMV sequences before missions and the only role I could distinctly remember him from was the supporting annoying jock from Can’t Hardly Wait.) While the voice acting is stellar in its delivery, it is all in Spanish and on a game that is very action oriented, it is a challenge to stop looking at the screen to read all of the subtitles. Because of that, I know some of Pablo’s dialogue with I.R.I.S. was definitely lost on me. Also, in addition to Freddie, the best character moment comes with the introduction of the man who will end up being the final boss fight of the game. I won’t spoil it here but seeing him in the game’s introductory FMV, I was hoping that wouldn’t be his only appearance. Unfortunately, this is where the story lacks as he doesn’t appear again until the game’s final chapter. Instead there is a fairly loose narrative focuses on I.R.I.S. and a rival bike named Spike who still works for Big Arms. 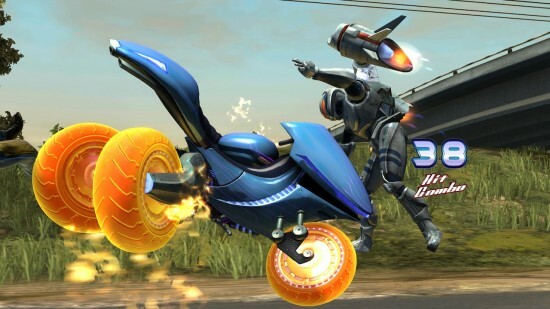 Lococycle looks fantastic though. With the XBox One power, it has the look of top quality CG animation with great lighting, effects and never any slowdown to worry about. There is a noticeable difference in how smooth even early titles on the new hardware run and how smooth everything looks. Since Lococycle takes the cartoonish approach with rounded edges, everything just flows visually on the screen. The gameplay is where Lococycle feels a bit lacking. The game is a combination of quicktime events and old school driving. Aside from that, there really isn’t much depth to it. The combat is very repetitive and the driving doesn’t exactly feel next gen. It’s sad as Twisted Pixel had taken a game that relied solely upon jumping in the past and made it new and original while this felt incredibly bland. Unfortunately there isn’t much else I can say about it as it really just falls short in that regard. Lococycle ends up being the lowest score I have given a game from Twisted Pixel. While I appreciate what they’re going for, this just didn’t happen to nail it out of the park like ‘Splosion Man or the Maw had in the past. While it isn’t a bad game, I also wasn’t disappointed by how short it was because the combat had already gotten repetitive enough by the end and I wasn’t looking for any more of it. Even when the game tried to switch things up a bit for a few select sequences, it ended up feeling really hallow. For $19.99, Lococycle can stay on its kickstand until a rainy day until there is maybe a 50% off sale.